The Academy presented a screening of “Heat” on Wednesday, September 7, 2016. 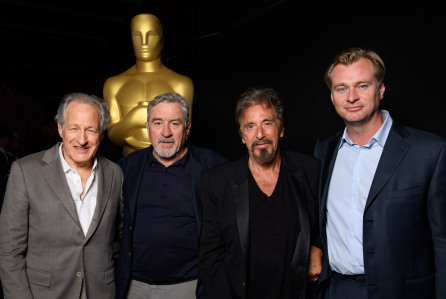 Pictured (left to right): Director/Producer/Writer Michael Mann, Actor Robert De Niro, Actor Al Pacino and Moderator Christopher Nolan. The Goldwyn Theater might not be the best equipped to demonstrate the full beauty of a 4K presentation, but the new print looked fantastic, with eye popping detail that shines a bright light on the work of cinematographer Spinotti. A particular stand out is how the new print makes clear some of the technical achievements Mann and Spinotti employed to make the city of Los Angeles itself as much a character as the actors moving inside it. “L.A. is a weigh station on the way to somewhere else,” said Mann tonight about the way the city looks throughout Heat. One way that was achieved was to combine then-new computer effects to heighten the city’s iconic cityscape.